Black sooty mold covering much of our property on the north side of our house results in anger? Well, yes. Or, maybe. Wait a minute, I am not so sure. But, I am sure that anger wraps itself around a victim and squeezes tightly. (As it did to me for a few days.) It is the python of human emotions. While I was finishing cutting off numerous palm fronds and tree branches sticky with a white, sugary substance (called honeydew) and slick with black sooty mold the rugose spiraling whitefly leaves behind, again I contemplated this anger I had. Really? Could I really be this angry at a whitefly (even if the South Florida press does call it an insect tsunami) that is feeding on much of our landscaping? At its root, the anger seemed misguided. But, surely there must be somewhere or something to whom, at whom, I can point the finger for this grave injustice. Meanwhile, this anger found me outside cutting back foliage surrounded by the tiny white creature flying about madly as I removed their food source. Spontaneously, I found myself asking the flies (while swatting them away from my head) if we could find a peaceful way to coexist. Say, possibly, a bit of a more balanced approach than black soot covering the north side of our property. Then, just as quickly and without conscious thought, I asked myself if I could find a bit of a more balanced approach when dealing with myself. Without making this too confusing, in other words, I discovered I was angry at myself. As soon as I had made that realization, everything softened. It all kinda drooped into a deflated acceptance. As the anger with myself melted, I was no longer angry with mother nature. Annoyed, perhaps, at still having to deal with this new insect wanting to feed on many of our plants, but the anger that squeezes tightly was gone. I continued working, yet the work was different. Yes, I still needed to remove the heavily infested fronds from one plant in particular. But, I now did so at a slower pace. I, once again, tuned into what was going on in nature around me. (While in my angry state, I was just whacking away at fronds not available emotionally to listen to the wind or the birds.) As I was finishing up, a large black and yellow butterfly came to rest on our viburnum hedge an arm’s length from me. It rested for a beat or two – longer than I’ve witnessed before. It seemed to be acknowledging my acceptance of anger at myself. At the same time, I acknowledged the presence of peace. Here is a summery creamy dressing to use on salads, stir into grains, or as a sandwich spread. Combine all ingredients except for the yogurt in a food processor fitted with the steel blade. Process until smooth. Add yogurt. Give it one more whirl or two to combine. Taste and adjust for salt. Do you feel content? Most likely, each of us would answer that question differently given our present life circumstances and our state of mind at the time. For Ollie, contentment doesn’t come easily. He is an intense pup. A good hour’s run will take the edge off, as it did the day I took the picture posted above. After a satisfactory run, he’ll rest comfortably during the day, albeit mostly awake and alert, always at the ready for his next adventure. God bless him. A good 2 1/2 hour romp including lots of running and play is really more his style. 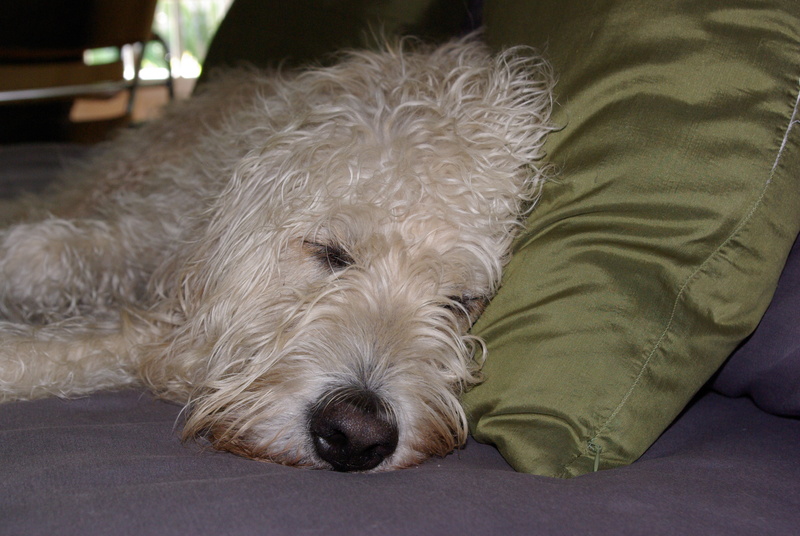 For most of us, much like Ollie, contentment does not come easily. I think each of us knows, subconsciously or consciously, contentment does not come from external sources. Our actions, however, indicate otherwise. How many of us when feeling bored, irritable, or disconcerted reach for a bag of chips or head to the mall for so-called retail therapy? As a society, we welcome distractions. There are times in my life when I think distractions, if used well, are healthy. If distractions are used as purely escapist behaviors, then a problem is simply being avoided. And, most likely, nothing is being solved or addressed. Let me give you an example. There is an obsessive side to me. I know it. It is there. It will most likely always be there. If I am obsessing about something, I can do one of three things. 1) I can continue to obsess about it. 2) I can sit with it in meditation and try to look beyond the obsession and dissect the emotional layers underneath. 3) Or, I can set it aside, choose a healthy outlet for my energy, and move on. This is where contentment and distraction intersect. In the example above, the problem arises if I choose to continually avoid the feeling or thought that is bothering me by using an escapist behavior. If I continue to avoid the feeling or thought by distracting myself, the problem will not be addressed; and, in all likelihood, it will get worse until it manifests itself in some way that demands attention. In this scenario, I have not moved toward well-being and contentment. I am seeking contentment externally, outside of myself. Whereas, if I take the time to simply acknowledge the feeling or thought, and accept it, if that is comfortable, and then remain with that thought or feeling by sitting quietly, I begin to address the issue. I have addressed the issue by not running from it, by acknowledging it, and maybe accepting it. I have taken a step toward well-being and contentment. If I choose to not acknowledge this part of me, distract myself, and run from the problem continually, I’ve then used distractions as escapist behavior. And, I have not moved toward well-being and contentment. There are a myriad of distractions in this world leading to momentary hits of pleasure, (plug your favorite in here… from retail therapy to gambling.) Daily distractions can and do continually rub up against our ability to be content like a persistently itchy mosquito bite demanding attention. So, what is the big deal? Why not scratch that darn bite? Seeking pleasure and happiness from external sources may bring us to a brief state of contentment, but it is not long-lasting. So, what is one to do to combat everyday life? Try resting in your own space without needing to do anything, just being. If you are game, try it for a few minutes each day. Sit comfortably in a quiet space. Listen to yourself breathe. See if it changes your perspective, or slightly, subtly, buoys your sense of well-being and contentment. Is it a cure-all? Will you stop wanting to scratch that mosquito bite? I don’t know. But, you may find you are a little less itchy, and more content. I really enjoy simple, vegetarian meals. But, to my mind, they’ve got to be substantial and full of flavor. Thanks to Molly at Remedial Eating, I now have another good, simple vegetarian meal to tuck into the back of my mind. No recipe required. I have long been a fan of roasted vegetables. A few of my favorites I put in the oven are parsnips, carrots, onions, sweet potatoes, and broccoli. But, I tend to roast my favorites again and again. Another good thing about Molly’s idea for a meal? 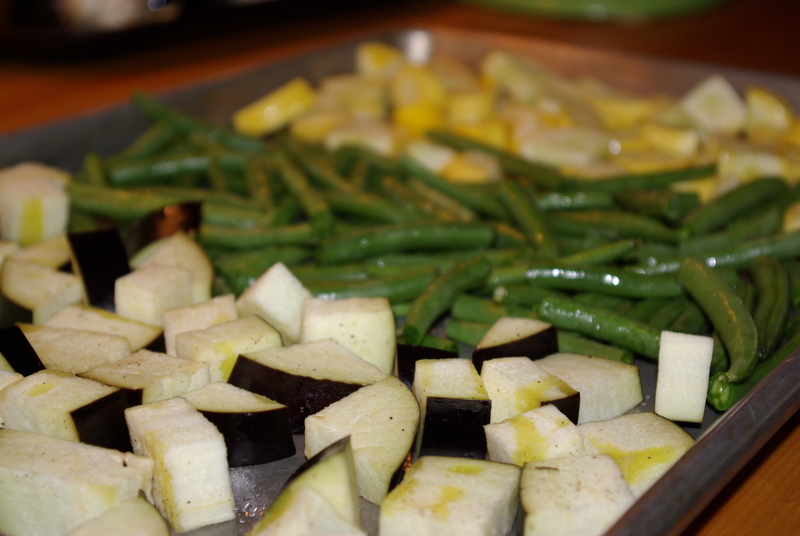 This vegetarian dish incorporates eggplant, zucchini or summer squash, and green beans. Vegetables I don’t reach for often enough. I am glad to have an excuse to roast something different. The basic components are roasted vegetables served over brown rice, a fried egg on top, and feta crumbled over the whole. 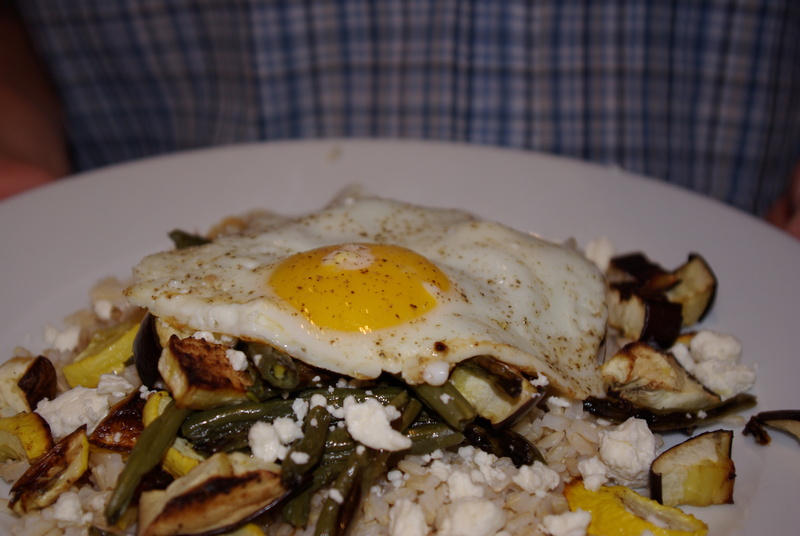 More specifically, I put on each plate a bed of brown rice, added a bit of soy sauce, placed the roasted vegetables on top of the rice, crumbled feta over the vegetables and topped it with one or two fried eggs. Cannelini or garbanzo beans could be incorporated for a bigger dose of protein and fiber. 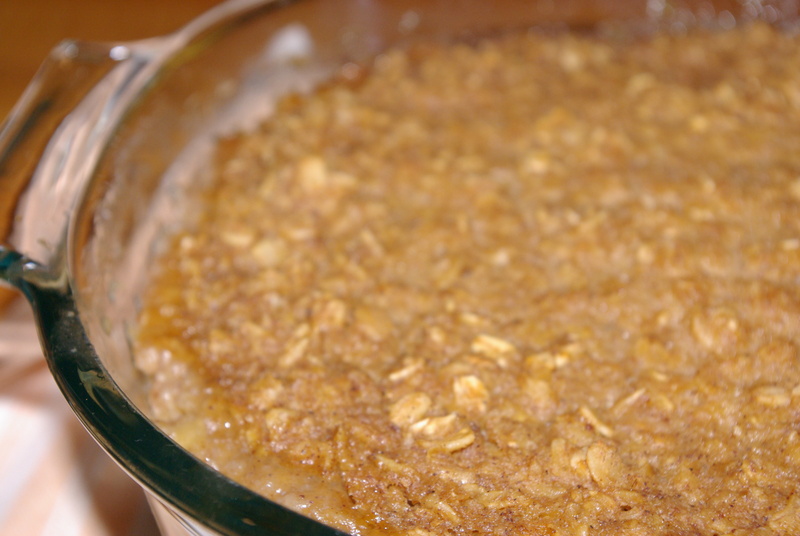 For those of you who prefer a recipe, below are loose guidelines to create this meal. Cheers. Begin by preheating oven to 375 degrees. Prepare the brown rice and let cook while the vegetables roast. 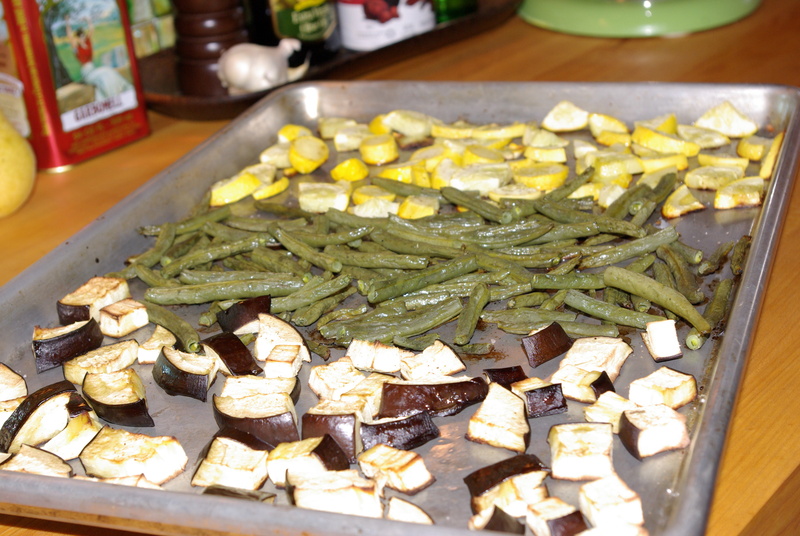 On a large cookie sheet or jelly roll pan, place prepared vegetables. Salt and pepper the vegetables. Drizzle olive oil, two to three T., over the entire batch. Toss to coat. Spread evenly on cookie sheet. Roast 35 – 45 minutes until vegetables are fork tender and begin to carmelize. Check after 35 minutes. Meanwhile, heat a medium size frying pan. As soon as veg is done, fry the eggs in a little butter and olive oil, season with salt and pepper. While the eggs are frying, place rice on each plate, drizzle with soy sauce, add veg., grate cheese over veg and rice, top with fried egg. Serve immediately.